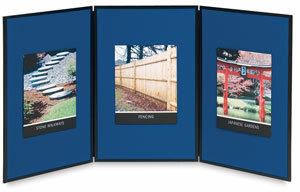 This lightweight, portable, trifold display system adapts to any environment. Simply unfold, place on a tabletop or floor in a classroom, cafeteria, office, lobby, or hallway, and your display is ready to go! 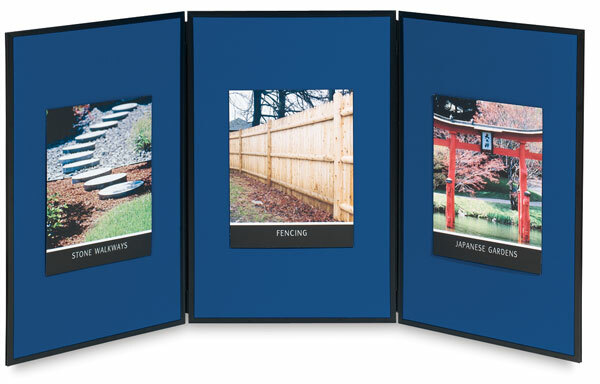 The display's two-sided fabric panels are gray on one side and blue on the other, providing a choice of neutral backgrounds for artwork, photos, science projects, or anything that can be attached with latch-and-key fasteners, tacks, push-pins, or tape. Use the 3-panel system by itself as a single tabletop display, or the taller 6-panel system as a floor display. When open, the 3-panel display measures 72" W × 38" H (183 cm × 97 cm). The 6-panel display measures 84" W × 76" H (213 cm × 193 cm). A fabric carrying bag is included. ® Acco is a registered trademark.® Quartet is a registered trademark.